Are you interested in finally knowing how much food you’re actually consuming on a regular basis? Alternatively, you might be interested in following through with a recipe that doesn’t offer regular measurements, only measurements that are shown by weight. No matter the reason, you could be in the market for a kitchen scale and being able to choose the right one is far simpler than most people think. The My Weigh Kitchen Scale helps to transform your cooking experience into something easy and enjoyable, not to mention it’s a phenomenal tool to use when you’re teaching your children about weight and measurements. As with most kitchen scales, it offers basic features such as a backlit display and a few weighing modes, but it also incorporates extra features you never knew you needed until now. The My Weigh Kitchen Scale is specifically designed to make cooking and food portioning simpler by doing all of the work for you. Simply take out an estimated amount of ingredients, place them in a bowl, and put them on the surface of the scale. At this point, the integrated sensors will determine the actual weight of the food and give you an accurate reading. In comparison to other kitchen scales on the market, there are a few upgrades included in this design such as its high weight threshold and the user-friendly controls and programmable features. Anyone who owns a kitchen can benefit from using a kitchen scale, especially the My Weigh Kitchen Scale because it focuses on the core concept of weighing food instead of distracting you with a bunch of unnecessary features. When it comes to preparing meals either for yourself or your family, you’re going to need accurate readings and if you’ve ever owned a faulty scale in the past, you’ll soon realize that this is a model that is designed to make weighing food easier and more accurate than ever before. Another interesting factor about the My Weigh Kitchen Scale that makes it applicable to everyone is that each of the weighing modes can be used for anything ranging from making soap to preparing meals for the week ahead. 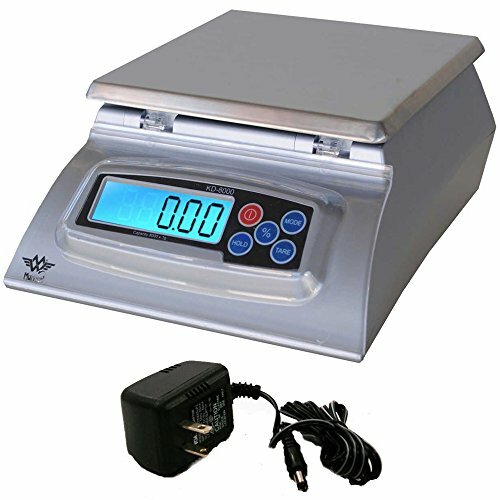 It’s also incredibly affordable when compared to other high-end food scales that offer the same features. With that being said, not everyone is in need of a kitchen scale. If you’re not on the journey to weight loss or healthy weight gain, and if you prefer to use traditional measurement utensils such as measuring cups, teaspoons and tablespoons, you’re not going to find a kitchen scale to be beneficial. As with any other kitchen scale, the My Weigh Kitchen Scale comes equipped and ready to use right out of the box. Within its package, you’ll receive the unit itself as well as three AA batteries and an instruction guide. Simply install the batteries, take a brief read through the instructions, and set the kitchen scale based on your personal specifications. One accessory that we wish was included is the AC adapter. Instead of relying on batteries, the My Weigh Kitchen Scale also has a port that is compatible with a traditional AC adapter, so you can always have the unit plugged directly into the wall for optimal performance. However, you may have an AC adapter lying around the house, or you’ll have to purchase one online. As mentioned, the My Weigh Kitchen Scale consists of the same features as the majority of kitchen scales on the market, except for a few that are unique. Most kitchen scales will offer four weighing modes, but this model offers five. Not only can you weigh in pounds, ounces, kilograms, and pounds per ounce, but you can also measure your ingredients based on percentages. This is extremely important for people who intend using their scale for baking or making household goods such as soap and candles. Instead of attempting to scrape food out of every crevice of your kitchen scale, the My Weigh Kitchen Scale offers a sleek and easy-to-clean design. The stainless steel body can easily be wiped down and be sure to take advantage of the removable splash guard that protects the digital display and function buttons. In order to get a clear understanding of whether one kitchen scale is worth your time and money, it’s important to put it up against some competition. When we compare the My Weigh Kitchen Scale to a renowned brand, OXO Good Grips, it performs incredibly well, though the My Weigh model is missing a couple of essential features. As an innovative design that every home cook will appreciate, the OXO Good Grips Stainless Steel Scale comes equipped with a pull-away display that physically detaches the LCD screen from the unit to prevent shadows as a result of larger bowls on the measuring plate. Even though the My Weigh Kitchen Scale is incredibly simple to clean, the OXO Good Grips model is even easier. 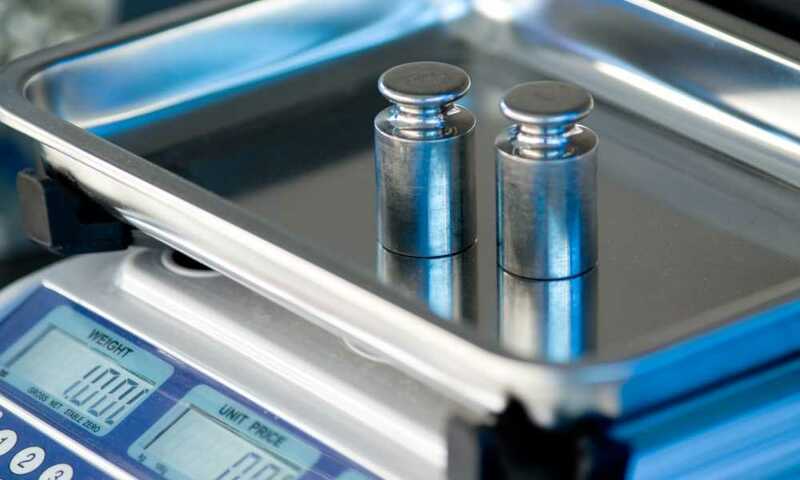 The measuring platform can be detached from the base and is constructed out of 100% stainless steel, making it incredibly simple to keep clean regardless of what ingredients you might be weighing. The My Weigh Kitchen Scale is a great tool to have at your disposal, even if you’ve never had the opportunity to use a kitchen scale in the past. With its basic and necessary features as well as several convenient user-friendly functions, it will surely become one of the most used small appliances in your home.